The villa has vaulted ceilings and is fully air-conditioned for your comfort, in addition, it has ceiling fans in all the bedrooms and the living room area. It has deep pile carpeting throughout, apart from the kitchen area and bathrooms which are fully tiled. This is a spacious, open plan room with vaulted ceilings and patio doors leading to the pool area. It contains custom made, high quality furniture, comprising matching three seater sofa bed, two seater sofa and an armchair. There is also a formal dining area with a large wooden table with thickly padded chairs providing seating for six people, plus coffee table, reading lamps and end tables for your convenience. We also have a large multi-channel cable TV, DVD player, and a CD Mini Hi-Fi system with a selection of films and CD's for your entertainment when you need to take a break from the Theme Parks! There is a telephone providing free local calls, which is great for ordering your take-away. The kitchen is fully equipped with a large cooker with easy to clean ceramic hob and matching built-in microwave. There is a large fridge/freezer, plus all the usual kitchen appliances and all the necessary cutlery and crockery to cater for up to 12 guests. There is also a breakfast nook in the kitchen containing a round, wooden table and 4 chairs, plus a child's high chair. 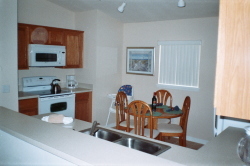 A dishwasher and garbage disposal unit are incorporated for your convenience and there is a utility area within the garage containing a separate washer and tumble dryer. Just off the hall, there is a storage cupboard containing an iron and ironing board. Master Bedroom 1 comprises a King Size Bed with matching bedside cabinets with reading lamps, large dresser with multiple drawers and mirror, plus cable TV and clock radio. 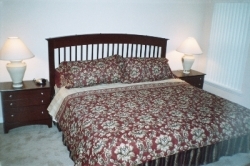 There is a large walk-in closet with ample hanging space, and an en-suite bathroom with a large double size shower with seating, wash basin and WC, and for the ladies, there are also hairdryers provided in each of the master bedrooms. In addition there are two large windows providing a pleasant outlook over the swimming pool. Master bedroom 2 comprises a Queen Size Bed with matching bedside cabinet with reading lamp, large dresser with multiple drawers and mirror, plus cable TV and a clock radio. There is a closet with ample hanging space and an en-suite bathroom with shower, wash basin and WC. This Bedroom has a double bed plus matching bedside cabinet and reading lamp and also has a double closet with lots of extra hanging space. This twin room also contains 2 single beds with matching bed linen, chest of drawers, reading lamp, plus closet with hanging space. This bathroom is shared by the double and twin bedrooms and features a tub (bath) shower, wash basin and WC. There is also direct access to this bathroom from the pool area which is always handy when you have children. We have a private, fully screened, South West facing 30' x 15' pool which has the advantage of opaque double screening on the lower portions and sides for added privacy. For those travelling with young children, a variety of pool inflatables and toys etc. are porovided and you will be pleased to know that there is a 4 foot high fence between the pool and the main building as a safety feature, this is removable if not required. 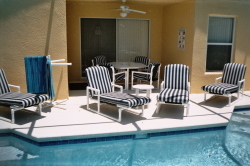 In addition the patio doors leading out to the pool area have an alarm which sounds each time they are opened. The pool can be heated if required and this is recommended from November to March. Deeply padded sun loungers are provided and ready for your relaxation by the pool, plus a patio table with chairs and a towel rail. There is a covered Lanai (patio) complete with light and ceiling fan for those who prefer some shade. The pool also has underwater lighting for that night time dip on your return from the Theme Parks, whilst you relax with a glass of wine and watch Disney's Magic Kingdom fireworks over the tree tops. 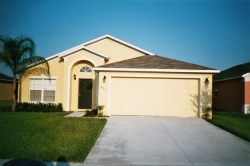 The villa is protected by a security alarm system that is monitored by ADT twenty four hours a day.